FCBD is a way to get comics in the hands of these people at no cost to them. The tricky part is to get the uninitiated into the comic book shops. I believe that publishers who have comics that feature familiar characters from the movies and television (Star Wars, Spider-Man, X-Men, Batman, The Simpsons, etc.) are crucial to the success of FCBD. Saturday, May 2 is the annual Free Comic Book Day. Honestly, I never thought this thing would last. But it’s been seven years since the first FCBD and it’s still going strong. I love it when I’m wrong. 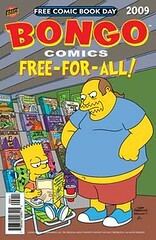 For any nerdly parents not in the know, Free Comic Book Day is an annual event where comic shops give away free issues. 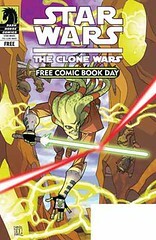 The giveaway comics are specially made by publishers for the event. The idea is to introduce non-fans to what’s out there now and entice them back for more. Touching on Bill Morrison’s quote above, here’s a preview of a few licensed titles to look for next Saturday. With so many super heroes moving from comics to other more successful platforms, it's cool to see these television properties lure kids back to world of word and pictures. 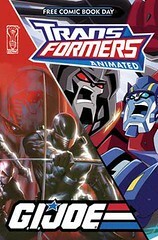 Prolific writer Chuck Dixon delivers a taste of THE SIMPSONS, THE TRANSFORMERS and GI JOE. Chuck is one of the old school pros who can deliver a tight action or comedy tale for any character. He’s a good fit for these books. Dark Horse Comics has thrived on it's catalog of STAR WARS spin-offs. This year they bring THE CLONE WARS, which, I'm told, all the kids love. You can preview it HERE. I’ll have more previews and info over the next few days. Cy here, and i have to thank you; i don't pick up titles on any regular basis outside of odd Warren Ellis' collections via Amazon, and i did not know about FCBD - so thanks! just received my first two Savage Sword of Conan collections and am going through them now. needless to say but i'll say it anyway - great blog! Make sure you get to the store early to secure your free copy of WILLIAM SHATNER PRESENTS! Glad you're enjoying the blog, by Crom. Shatner presents what exactly... free Tek?